As a petrol head, my garage is adorned with Gladiator garage works rails and various storage solutions to maximize space in that area of my house. Now I can do the same with my Lego. Doss Industries has created Brick Rack, a system of display racks that allow you to get Lego up off the floor and on the wall like the art they are. 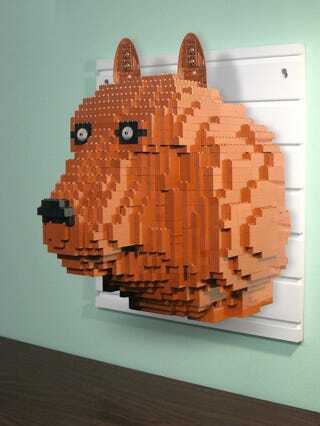 Standard Lego bricks can be slid into the rack and then used as a small base for displaying minifigures. I plan on constructing some brick built shelves to place models on top of. There are several options available for purchase in their online store from a small display racks to larger wall systems with keyholes to aid in hanging. Unfortunately at this time, the only color available is white.